There is live music 365 days a year in Austin - I'm just going to report on what I've seen or what new music I'm listening to! We were in Montreal last Thanksgiving week when Bruce announced his 2012 European tour dates and the decision was made to go. A few weeks later and the plans were in place to travel to Zurich and Vienna for vacation and shows. The issue remaining was how to get home – flying on American on miles and they don’t fly to Vienna. The solution was to get to London where we could get home on AA. A few days later I realized that Bruce was playing Hyde Park in London that weekend so another show was added and good fortune that was! It seemed like it took forever but July finally arrived and we were off for our first ever European concerts. We flew from Austin to JFK and then connected to a Zurich flight. Except there were issues – first the gate was changed (never a good thing on an international flight) then the plane had mechanical issues and finally the flight was cancelled! 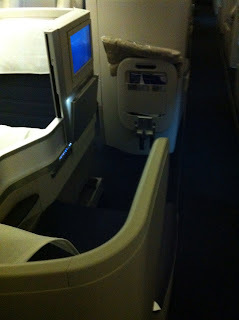 We ended up getting re-booked on British Airways leaving at midnight so it was off to that terminal. After great confusion on whether they were actually going to allow us on the plane we were finally cleared and off to the gate. Making our way to the gate we noticed another BA flight that was boarding so Jo asked the gate agent if there was any way we could get on that flight. We didn’t need to sit together but just needed to get to London sooner. The agent said the flight was completely booked but let me see your boarding passes. After several calls and a few minutes she came back and told us to go to the BA Executive Lounge and that she was doing her good deed for the day. The lady there would have new boarding passes and enjoy the full dinner being served in the lounge. Turns out the new boarding passes moved us from the last row of coach into Business class on one of the brand new 777’s with seats that turn into beds. We took advantage of the meal and met a really nice couple from KC (more on that in a few days) and then went and boarded the plane. It was like riding in a spaceship – Jo spent 15 minutes figuring out all the buttons and switches. After we took off Jo pushed the buttons, laid down and slept to London. I took advantage of some additional food on the plane, got several hours of sleep and a little breakfast. Sure a lot better than those commoners back in coach! Unfortunately we left JFK 30 minutes late and although we hustled through Heathrow we missed our connection. We got on the next flight but ended up arriving in Zurich 9 hours later than the plan. Jo’s twin sister and one of their best friends from Chicago were meeting us in Zurich so they had been on their own all day. The target for the day had been to go to the antique flea market on Saturday in Zurich but we had missed that window. Jo was distraught but felt better after meeting up with the others when she found out she hadn’t really missed a thing. I had originally planned on checking out the stadium that day and figuring out how the Front of Stage (FOS) tickets worked but that was not to be after the extended travel. 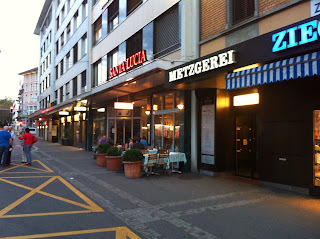 We decided to get some dinner so jumped on the tram for a few stops into an area with several restaurants. We settled on a place called Santa Lucia that served us a couple of great pizzas and some cold water to replenish the travelers. 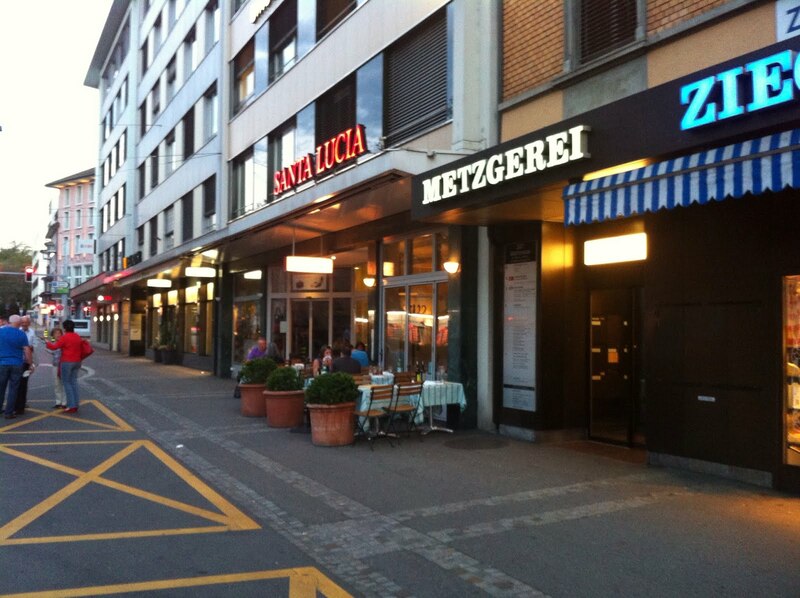 It was a beautiful night in Zurich and the perfect meal to get us on the right time zone. We headed back to the hotel and fortunately we had been upgraded to the club level. After grabbing a couple of ginger ales in glass bottles (since they served the P word) and it was bed time on day one of the adventure. Always looking for new music to listen to - I love the uniqueness of Austin's music scene but you can never beat a show by Bruce!